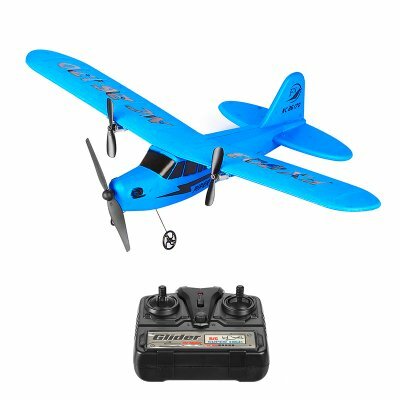 Successfully Added RC Airplane - Light Weight, 150mAh Battery, Remote Control, 120m Flight Distance, 13 Minutes Flight Time to your Shopping Cart. NOTE: This product will be delivered in either red or blue. This cheap RC airplane is a great toy for children who are dreaming of becoming a pilot. The RC toy is very easy to control with its 2.4GHz remote. It furthermore is light in weight and durable. Therefore, you won’t have to worry when your son or daughter accidentally crashes it into something. With its 150mAh battery, this RC airplane treats you to 13 minutes of flight time. It furthermore supports a 120-meter flight distance. This brings along total freedom to fly around without any limitations. Thanks to its lightweight and compact design, this RC airplane is great to be used indoors or outdoors on sunny days. Powered by three propellers, this RC toy lets you smoothly cruise through the skies. It has a ready-to-fly design which means it’s ready for usage straight out of the box. Just make sure the battery is charged, and you’re all set. With this RC airplane, your child is guaranteed to enjoy hours’ worth of fun to come. If you are still looking for an original holiday present but a regular drone is too expensive or advanced, this RC airplane is the perfect gadget for you. This RC Airplane comes with a 12 months warranty, brought to you by the leader in electronic devices as well as wholesale electronic gadgets..